This is just a sampling of the many, many possibilities. All of them are ways to attempt to solve what can be termed "the orange peel problem." This term comes from a lesson plan, one I would be doing if we had more face-to-face sessions: take an orange (or clementine, since they're easier to peel), draw a map of the world on it, then peel it and try to lay it out flat. You'll have to make choices about where to make the splits, and then of course it won't lie flat. Here's a short video that demonstrates the problem and then explores several approximate solutions: cylindrical transformation, conic transformation, and planar transformation. Do the differences among these projections matter? No...and yes...and yes. No: All of the projections are just solutions to the problem of translating a three-dimensional, curved surface into a flat representation. As long as a transformation meets your needs, it did the job. Yes: Different projections can be more or less difficult to interpret (e.g., Homolosine projections require mental "stitching back together" to join sections separated by white space) or even mis-leading (if you confuse the distorted, two-dimensional transformation for the reality of the spheroid). Yes again: Geospatial technologies that display geospace (duh...but hang with me for a moment) have to use projections. This is fairly obvious when you zoom out in a tool such as the Flickr map (see below): the earth is clearly distorted (it's tiled!! ), and therefore you know that it's a projected map. Does this apply to geospatial tools that work with non-map renderings of geospace? Consider what we did with GPS units: we used them to give us point data...that's not a map...so is there a projection issue? Or consider Google Earth: that's a dynamic globe, rendering a 3-D image of the earth's sphere...surely there's no map projection issue there, right? 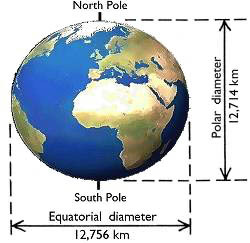 Actually, yes: There are different algorithms and datasets for generating that sphere (or oblate spheroid – see below). Google Earth uses the WGS84 data system (World Geodetic System 1984 – see confluence.qps.nl for more info than you can use on it). You can set a GPS to use other data systems, such as WGS83 or WGS72 or NAD83 and on and on. This will matter in your work because as you try to mash maps together, they may or may not mesh...because they're in different projections. Take a look at the next image: it shows an image overlay of Google Earth (a map stretched over the satellite imagery) in which the two don't line up. This is because the map is in one projection (or, worse, no projection) and Google Earth is in a different projection. This is more likely with large-scale maps than small-scale maps, in which projection is not as big of an issue. Final note: One of the many pleasures of lat-lon point data is that it is pretty universal: You can import it into any GIS or dynamic globe or map, since they always (or almost always) recognize lat-lon and can correctly place it within their projection. An excellent, quick overview of map projections and scale by Michael Pidwirny of UBC. And now that you appreciate something about the differences and history behind map projections, you may be amused as I am by this explanation by webcomic XKCD: What Your Favorite Map Projection Says About You. This makes me laugh every time I read it. Also: The bottom of the page has DETAILED explanations, and further links, for each projection! It's awesome and terrifying when people funnier than me are also smarter/better-informed than me.